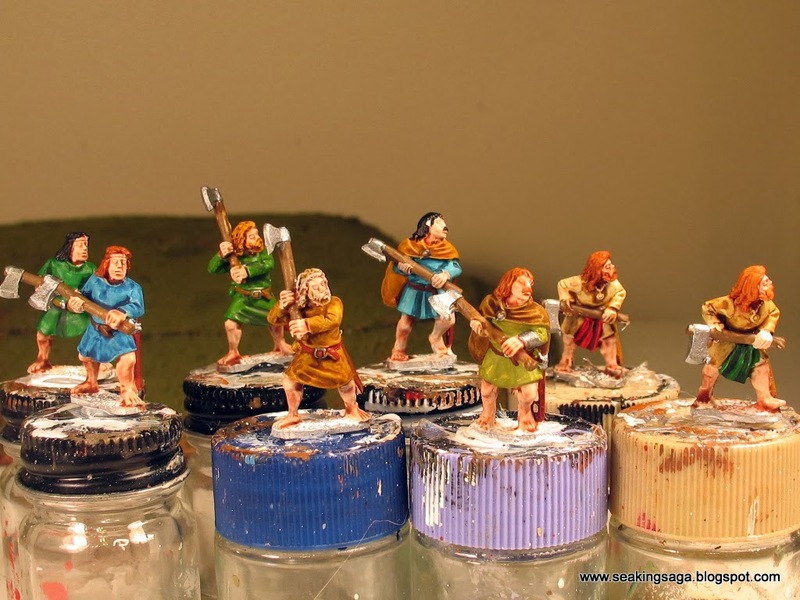 This is the first in a series of posts about the historical figures associated with the Norman invasion. Historical information, miniature options, wargaming uses and historical fiction will be covered in this five (possibly six) part series. 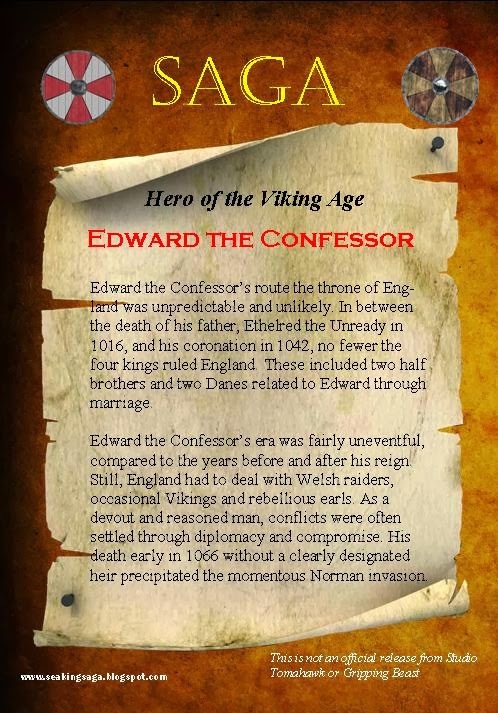 While not a warrior or conqueror, Edward the Confessor was certainly a compelling figure in the eleventh century. The unique circumstances of his life and death led to the Norman invasion which is often rated as the most significant event in English history. He was born c. 1003, the son of King Ethelred (the Unready) and Emma, daughter of Duke Richard of Normandy. After his father's death, Edward and his brother Alfred went to live in Normandy among his mother's relatives. It was here that he developed an outlook on religious practice and organization that differed from his home country. 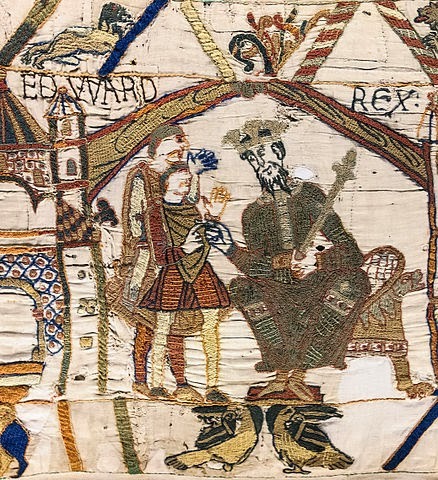 Edward was finally invited to rule in 1042 after the death of his half brother Harthacanut. He took the throne beholden to the powerful Godwin, Earl of Wessex, who years before had a role in the murder of Edward's brother, Alfred. Throughout his reign he tried to check the growing power of the earl and his numerous sons, but was apparently forced into a marriage with Godwin's young daughter Edith. It was a childless marriage, the nature of which is still a source of speculation. In 1051, conflict with the Godwins over appointments and the treatment of royal guests escalated to such a degree that the Earl and his sons were exiled from the kingdom. Edward's triumph over the family was brief. A year later, with Godwin and his men encamped in London and his own army wavering, Edward was forced to restore the family to their lands. After Godwin's death in 1053, the aging Edward left more and more of the kingdom's administrative duties to Godwin's son Harold, but nonetheless encouraged his earls to strongly deal with threats from Scotland and Wales. He died in January of 1066, and was buried in the still unfinished Westminster Abbey, a project that he had begun over twenty years earlier. He was eventually canonized, the only English king so honored. 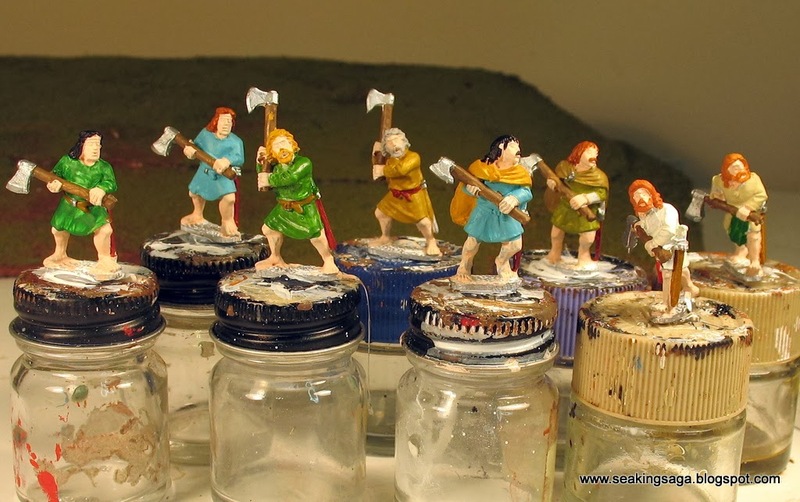 As far as my googling skills could turn up, no manufacturer markets an Edward the Confessor figure in 28mm (or any other scale). Edward was often described as a tall, fit man with a prominent white beard. 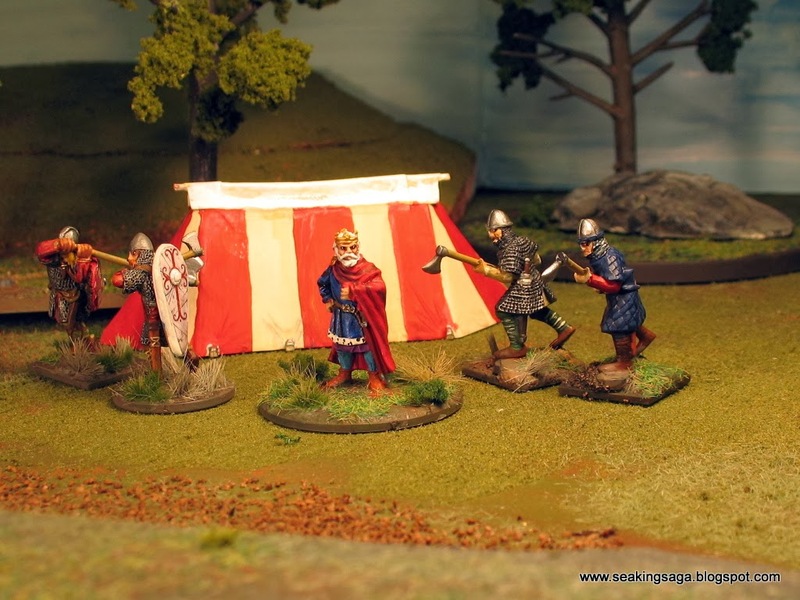 The figure pictured above is an Anglo-Saxon king from Black Tree Designs. 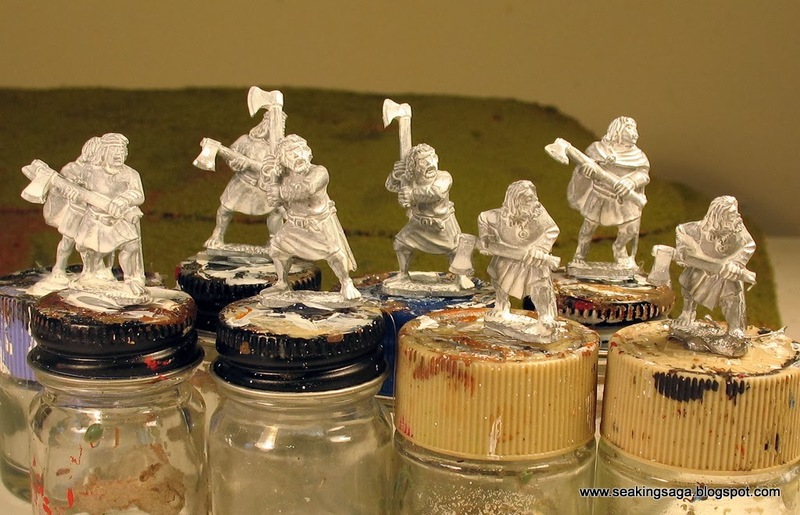 His guard is a mix of Gripping Beast metals and Conquest Games Normans with Dane axes. Edward is not exactly a character that the average gamer is clamoring to play. He was not a warrior, and England had little direct threat during his reign with occasional raids from her neighbors. In fact, with little to fear from overseas invaders, Edward ordered much of his navy scrapped, lowering taxes in the process. 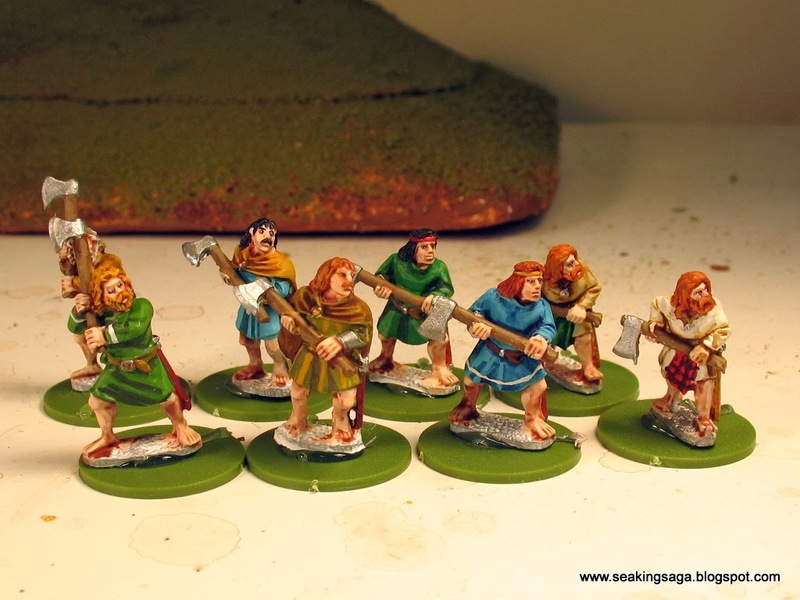 However, with the three principal belligerents from 1066 (Harold, Harald and William) already depicted in SAGA, it is natural to find a place for Edward. One could use generic Anglo-Saxon or Anglo-Dane king as Edward, and give him typical Warlord rules. For a more customizable character, I used two of the Charlemagne traits from The Raven's Shadow, along with a modified two SAGA dice rule. It should be acceptable in terms of game balance and if anything, Edward is nerfed a bit like my previous custom characters. 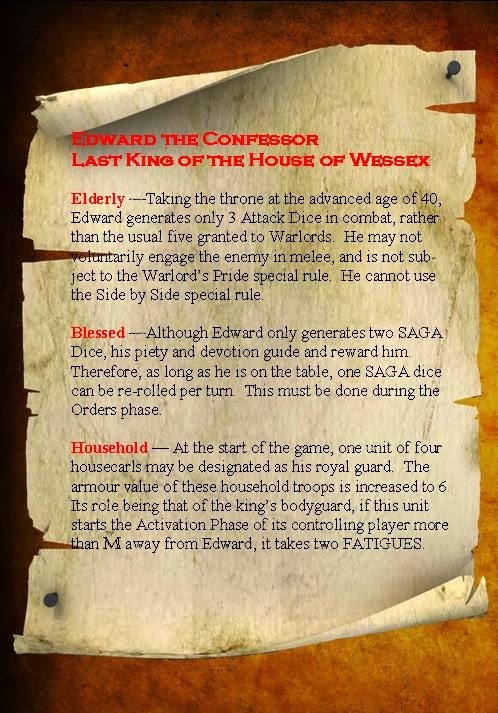 Elderly: Taking the throne at the advanced (Medieval) age of 40, Edward generates only 3 Attack Dice In combat, rather than the 5 usually granted to Warlords. He may not voluntarily engage the enemy in melee, and is not subject to the Warlord's Pride rule. He may not use the side by side rule. Blessed: Although Edward only generates two SAGA Dice, his piety and devotion guide and reward him. Therefore, as long as he is on the table, one SAGA Dice can be re-rolled per turn. This must be done during the Orders Phase. Household: At the start of the game, one unit of four Housecarls may be designated as his royal guard. The armour value of these household troops is increased to 6. Its role being that of the king’s bodyguard, if this unit starts the Activation Phase of its controlling player more than M away from Edward, it takes two FATIGUES. The predominant view of Edward has long been that of a saintly and slightly withdrawn king who cared little for earthly matters, aside from hunting. For a nuanced view of King Edward, check out Alfred Duggan's The Cunning of the Dove. Decidedly pro-Norman and anti-Godwin, Duggan's pre-1066 England is withering under fractious rule by incompetent and jealous earls. King Edward is genuinely devout and celibate, who, as the book's title implies, subtly tried to insure that his successor will be one who will reform the church and centralize authority. Edward the Confessor also plays a prominent role in Julian Rathbone's The Last English King. Here he is not so celibate, in a not-that-there's-anything-wrong-with-that depiction. This Edward is also more petulant and selfish, and lacking the foresight to see the damage that his death will bring to England. It's also a very thought provoking book about the basis of power and authority, along with some intentionally sly anachronisms. Up next will be a look at Edward's brother in law and immediate successor, Harold Godwinson. This week, I met up with a SAGA gamer through the Studio Tomahawk forum who lives relatively close to me. For those who live in a game store laden metropolitan area, "close" means someone who shares this rather obscure hobby within an hour's drive. 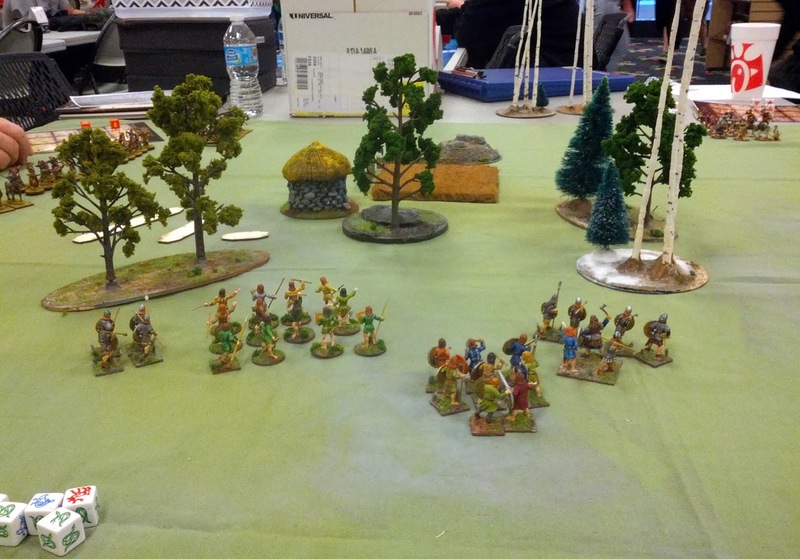 With three people playing, we went for the Feast of Crows scenario, slightly modifying the starting deployment. 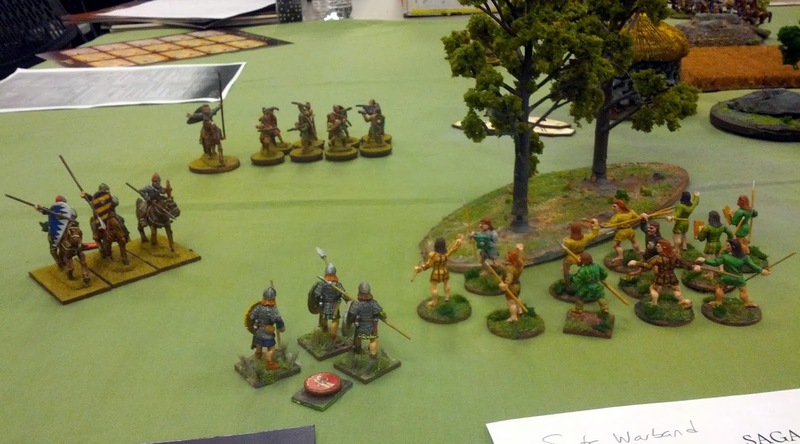 I fielded my Scots, my first time playing the faction, while my two opponents went with the Normans and the Welsh. If one wants to be historical, its an encounter that could take place in Northumbria in the 1070s or 1080s, as the Normans pushed the boundaries of their English conquests. 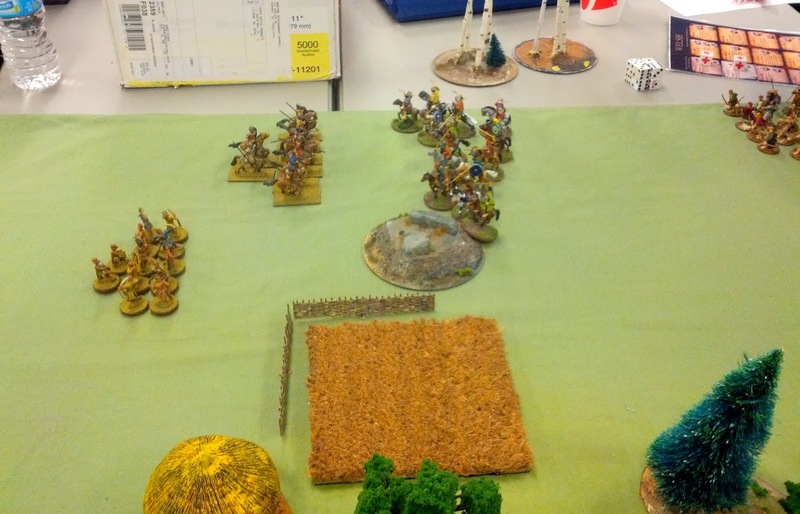 Above, after the first turn, my Scots move into cover with Normans to the left and Welsh to the right. 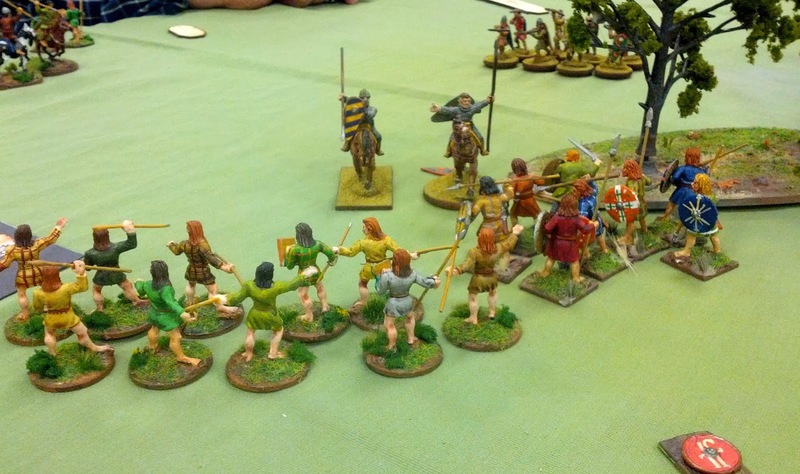 The first encounter takes place between the Normans and Welsh, as a group of Sergeants get pelted by Welsh javelins. 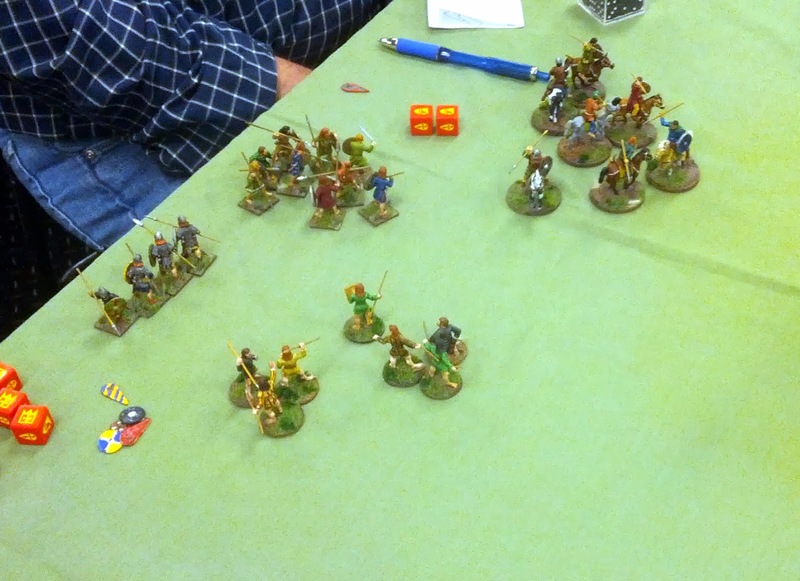 On the other side of the field, Norman knights take a hit from the Scot Levy javelins as they bear down on a unit of Thanes. 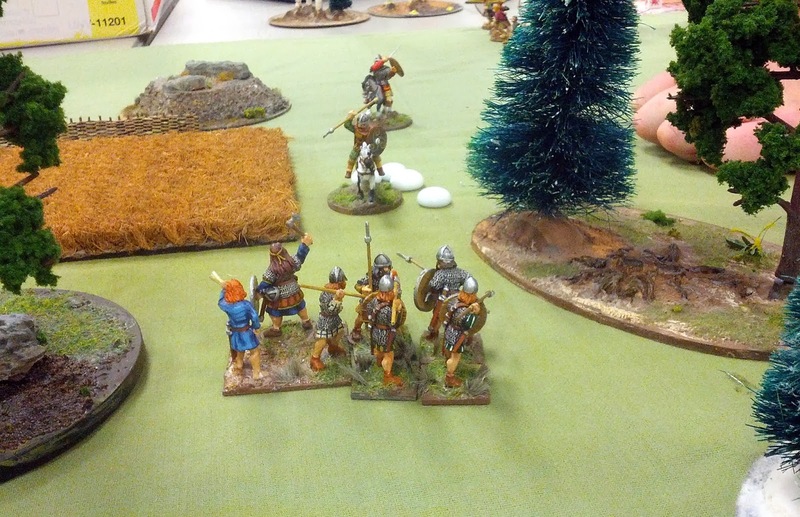 The Thanes were wiped out by the Knights, with me losing three of the Scots for two Knights. Above, I pull up a unit of Soer-Chele to assist the levy. 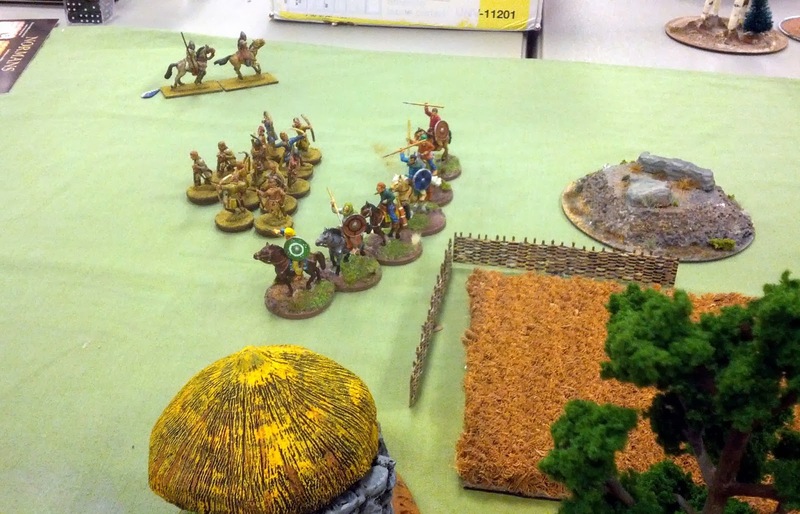 The Scot Warlord and Thanes turn back the Welsh Warlord and mounted Teulu without a single loss. 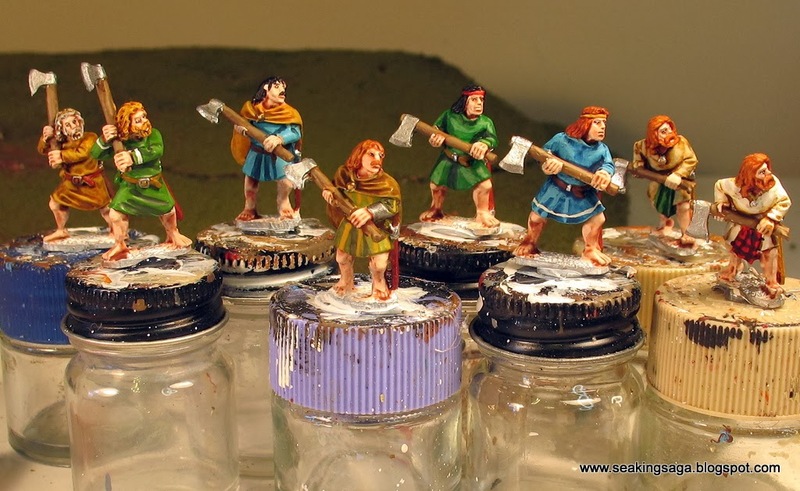 The Norman player's collection of defeated models, winning with the most victory points. My quick after-analysis says that Norman win was because the player took advantage of their two strengths - they are "shooty" and heavily armored. I like the Normans for the same reason. Despite my second place finish, I feel good about the Scots and plan to use them again, but perhaps with a bow levy instead of a javelin levy. They are very defensive, which suits my play style very well, but with some nasty abilities such as Hold the Ground and Give Ground, both very devastating if used correctly. Thanks to The Battlegrounds in Dalton, Georgia for letting us use their space. I am sure we looked odd amongst the Yugioh and Magic players, but their stock of board games and RPGs was top notch. Their racks of vintage NES, Sega and Playstation games was temptingly nostalgic, and I plan to pick some up the next time I am in there. 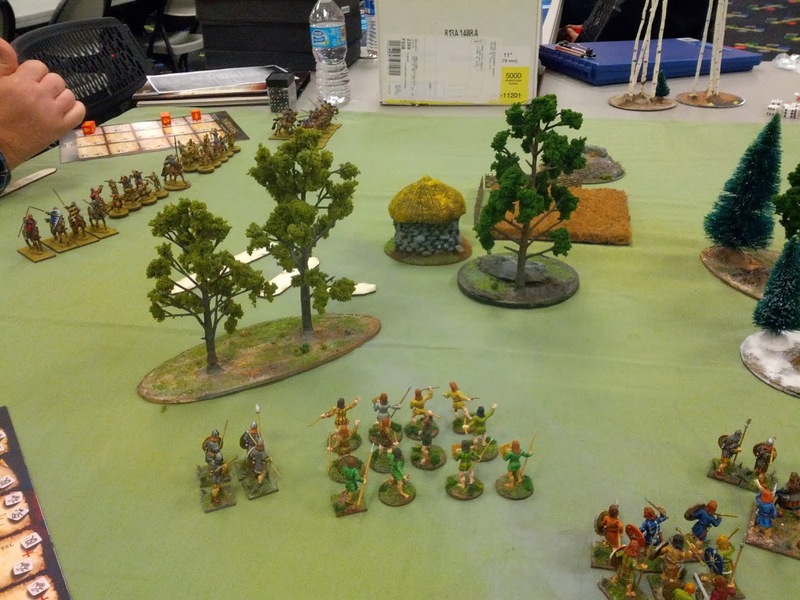 I look forward to more battles with my new friend, and possibly converting some of the curious teens who wandered over to our table into wargamers.